Accessible and memorable, video is an increasingly important content format. So what should you consider when creating video for your campaigns? Video is increasingly powerful force in the world of content. Vlogs, how-tos, explainers, webinars and more; video is an ever-accessible way to build trust, develop understanding and create better relationships with your customers and viewers. Video is one of the top-cited disruptors in our [State of Inbound] survey. Many see video as a great channel to better connect with a prospect. 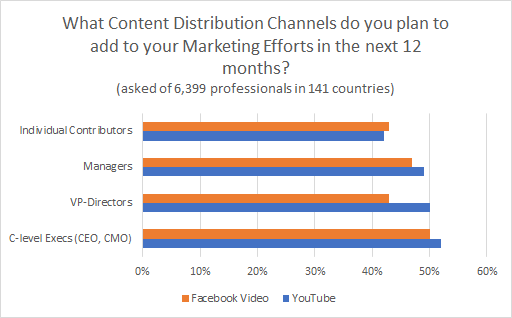 When 6,399 professionals were asked “What content distribution channels do you plan to add to your marketing efforts in the next 12 months” in the State of Inbound, the introduction of YouTube and Facebook Video led the field. Clearly video is one of the fastest growing forms of visual content as it’s easily digestible and memorable; for example if your audience hears a piece of information, they’re only likely to remember 10% of it three days later - yet will recall 65% if they’re presented with the same information visually. Video content is also widely accessible; it can be made available across a range of channels from your website, to blogs, to emails - and can be promoted through channels like YouTube, or on other social networks. Of course not all video content is good video content. Quality, messaging and relevance are all-important factors for video content to be digestible and successful. So what should you keep in mind when creating videos for a marketing campaign? Who is your video for? What persona or key account are you addressing? And what pain points, interests, challenges and messaging are they expecting your content to address? Most marketing videos in an inbound or ABM strategy will have a goal centred around nurturing the right buyers through their purchasing journey. Understanding your audience’s interests and challenges at each buying stage is core to creating content that will resonate. Like any other piece of content, before you start creating, it’s wise to map your video to a specific topic hub and buyer’s journey stage. Whether you’re creating a top-of-funnel introductory/explainer video, or a more in-depth middle or bottom-of the funnel webinar, plan multiple videos to address multiple stages - and have each one address a specific, stage-relevant challenge. Don’t try to fit every aspect of your topic into one video! Why are you creating your video? What goal do you want it to achieve? Video can be used for a range of purposes; to drive brand awareness, promote thought leadership, to address your audience’s challenges and more. Whatever the goal and purpose, it’s important to stay focussed; using the right messaging, style and promotion to achieve that goal. For example, you may want to drive brand awareness with a ‘meet the team’ style video. You might want to highlight the benefits of your services with a case study video. Or you might create a personalised video for an ABM campaign. Here your video must really address the specific concerns and goals of that target account for your content to be successful and achieve its purpose of enhancing the account relationship. What action do you want viewers to take next? The Content Marketing Institute provides some good tips on CTAs that should be used to match the tone/purpose of your video; for example, does the CTA help your viewers find the next video in a series? Does it encourage them to subscribe for more content? Does it direct them to a landing page? Does it encourage them to click through to purchase a product? When deciding on a CTA, consider where in the nurture process your video sits, and what next-stage action would be most appropriate. As quoted by MarketingProfs in this infographic, 26% of users look for more information after viewing a video so an effective CTA is essential. According to Wistia, videos of around 2 minutes long have the best engagement levels (70%). Lengthier videos drop in engagement levels - but even at 20 minutes, engagement only drops to c.45% - again underlining video’s popularity and accessibility. Regardless, for your message (and CTA) to receive best attention, be sure to keep videos punchy, precise and ideally under 2 minutes. For best recognition and consistency, remember to keep to your brand style at all times, across all of your videos - using the same logos, fonts, colour themes and styles. This will make you easily recognisable for repeat visitors. Equally, if you’re trying to build an audience and gain traction, try to be consistent when publishing videos - for example uploading a daily vlog to YouTube every night at 6pm, or posting a weekly ‘insights’ video to your blog every Friday afternoon. Video is a highly effective, engaging content type. And, like other content formats, you need to be able to assess its effectiveness and return on investment. According to MarketingProfs, 50% of professionals worldwide, name video as the content type that provides the best ROI. When considering video ROI, remember that return can be assessed in a number of ways. For example, views, shares and engagement may be important if your goal is brand awareness. Webinar sign-up, or landing page conversions may be your focus with a lead gen goal. Or for ABM, ensuring individuals from your target account viewed the video may be your marker of success. Whatever your goals and motivations, make sure you can monitor, track and analyse your video content to measure ROI. Companies using videos in their marketing grow revenue 49% faster year-on-year than those that don’t. (Aberdeen Group, 2015). The direction of your videos will largely depend on your wider campaign goals, audience and topics, but considering video within your marketing strategy can offer great value both to your business and to your audience.